Dr Rebecca Vanders’ work is contributing to innovative new treatments for pregnant women, their babies, and those trying to conceive. Rebecca is a passionate women’s health advocate. Her research is specifically focused on maternal health issues, including infertility caused by endometriosis and polycystic ovary syndrome, the effects of cigarette smoking during pregnancy, and maternal immune system changes. Above all, Rebecca’s work is about helping pregnant women and their babies stay healthy. Rebecca’s current research seeks to understand why pregnant women are more vulnerable to serious respiratory virus infections, such as influenza, and how their health can be protected through targeted, safe interventions. Throughout pregnancy, a woman’s immune system naturally alters to accommodate the presence of her growing baby. Slightly lowered defence mechanisms allow a baby to grow healthily—so the mum’s immune system doesn’t attack the new life—but it also leaves expecting mums vulnerable to certain viruses, like respiratory infections. As yet, researchers don’t know exactly how changes to the maternal immune system increase a woman’s risk of experiencing serious complications caused by respiratory virus infections. But by examining how key antiviral cells change during pregnancy, Rebecca is uncovering new insights into how our bodies work—and what’s causing maternal health vulnerabilities. “We have found that, during pregnancy, respiratory virus infections such as the flu cause certain cells to become ‘exhausted’. This prevents cells from functioning properly to fight off the infection. Based on their research findings, Rebecca and her team are working on a new therapy to reverse cellular exhaustion during pregnancy, allowing key immune cells to fight off invading pathogens. “If we can develop a treatment for pregnant women that protects them from the adverse outcomes of respiratory virus infections, especially during pandemics, this would quite literally save their lives." For most expecting mothers, their baby’s safety is top of mind. So when health challenges strike, it can be difficult for women to know which treatments are safe, both for themselves and their little ones. Rebecca and her team are determined to meet these challenges head-on. Their newly designed therapy to help safeguard expecting mothers from deadly respiratory infections has already showed promising results, which are due to be published in 2019. Over the next year, the therapy will continue to undergo further refinements. Rebecca’s work is providing critical hope to millions of women. It’s also contributing to important, and potentially life-saving, conversations worldwide. 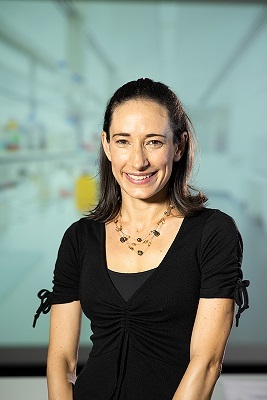 In recent years, Rebecca has presented at national and international conferences, authored multiple papers, and received two fellowships, including the Thoracic Society of Australia and New Zealand Astra Zeneca Early Career Research Fellowship and and a highly competitive NHMRC Early Career Fellowship. In 2018, Rebecca was among 15 highly talented researchers invited to participate in the University’s ThinkWell Early and Mid-Career Women’s Development Program, facilitated through the Faculty of Health and Medicine's Gender Equity Committee. The invitation was a nod to Rebecca’s evident career success so far—and served to further cement her research ambitions. “In my opinion, pregnancy is the most wonderfully fascinating and complicated immune state created in a women’s body. It is so perfectly designed and yet so complicated to understand—which is both exciting and motivating!" Dr Rebecca Vander is a Post-Doctoral Research Fellow with the University of Newcastle’s School of Biomedical Sciences and Pharmacy. Her research is contributing to new maternal health treatments by exploring challenges faced by women during pregnancy: conditions such as asthma, endometriosis, polycystic ovary syndrome, preeclampsia, gestational diabetes and viral infection. Rebecca completed Honours in Microbiology and Genetics in 2008, followed by a PhD (Medicine) with an APA scholarship at the University of Newcastle in 2013, where she received the prestigious Vice Chancellor’s Award for Academic Excellence and achieved second place in the University’s Three Minute Thesis competition. After her PhD, Rebecca secured a post-doctoral research position at the University of Newcastle, supported by early career research fellowships from NHMRC and the Thoracic Society of Australia and New Zealand Astra Zeneca. Rebecca has presented her work at multiple national and international conferences, including the American Thoracic Society International Conference in New Orleans and the AstraZeneca National Respiratory Leadership Summit. She has also participated in several public radio interviews and authored nine abstracts (including seven first-author abstracts). Rebecca is currently researching the maternal immune system and, specifically, the role it plays in putting women at higher risk of serious respiratory virus infections during pregnancy. One of her major discoveries was that key immune cells, including DCs and CD8 T cells, are altered during pregnancy, but that by blocking PDL1:PD1 interactions, maternal antiviral immunity can be restored. These findings were published in the second-highest ranking respiratory journal: American Journal of Respiratory and Critical Care Medicine. They have also led Rebecca into the next phase of her research career: helping to design a new therapy that can reverse cellular exhaustion during pregnancy, allowing cells to fight off invading pathogens. © 2015 Future Medicine Ltd. Pregnancy is a unique state requiring alterations in maternal physiology to accommodate the growing fetus. Whilst the maternal immune system is normally well adept at performing this task, the presence of immune disorders, such as asthma, often lead to pregnancy-related complications affecting both mother and baby. Australia has a high prevalence of asthma; with approximately 12% of pregnant women reported to have current asthma. Poor control of asthma is of far greater risk than the use of asthma medications. Being able to identify complications associated with asthma during pregnancy is of great importance in providing appropriate asthma management and medical care to these pregnant women, which may have lifelong consequences for their offspring. © 2014 Elsevier Ireland Ltd. Pregnancy provides a unique challenge for maternal immunity, requiring the ability to tolerate the presence of a semi-allogeneic foetus, and yet still being capable of inducing an immune response against invading pathogens. To achieve this, numerous changes must occur in the activity and function of maternal immune cells throughout the course of pregnancy. Respiratory viruses take advantage of these changes, altering the sensitive balance of maternal immunity, leaving the mother with increased susceptibility to viral infections and increased disease severity. Influenza virus is one of the most common respiratory virus infections during pregnancy, leading to an increased risk of ICU hospitalisations, pneumonia, acute respiratory distress syndrome and even death. Whilst much research has been performed to understand the changes that must take place in maternal immunity during pregnancy, considerable work is still needed to fully comprehend this tremendous feat. To date, few studies have focused on the alterations that occur in maternal immunity during respiratory virus infections. This review highlights the role of dendritic cells (DCs) and CD8 T cells during pregnancy, and the changes that occur in these antiviral cells following influenza virus infections.